Hope the holidays didn't overwhelm you and the new year is treating you right. Was one of your resolutions to learn a new skill? If it was to filet a fish, play chess or make a souffle, I can't help you. However, if it was to learn how to sew, especially, make your own clothing, I can! I will be starting a sewing class at the Workhouse Art Center this coming Wednesday, January 11, from 7-9pm. This six week course will cover the basic skills of how to read a commercial pattern and make slight adjustments for your figure. You will make a simple skirt as a base for future creative fashion adventures. 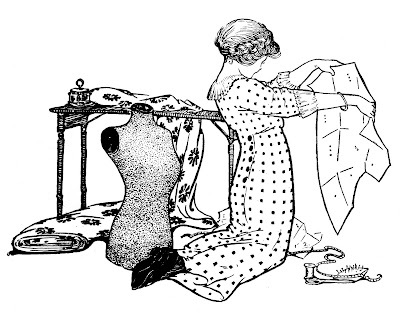 If you think you would like to make your own clothing, this is a great place to start! I will be able to guide you through the beginning steps and process to something a little more complex. You should have your own machine, iron and basic sewing supplies. The cost is $110 for members of the Workhouse and for $125 for non-members. There is also a $10 materials fee to be paid to me for materials I will provide. The class meets at the Workhouse Arts Center in Lorton, VA from 7-9pm for six weeks. To learn more and/or register, please visit the Workhouse Arts Center's catalog here. In addition to this class, I will be teaching a Fiber Photo Transfer Workshop and a Recycled Fabric Tote Bag Workshop. I like your blog, very special for me.